Candidates in Yebyu Township discuss the ambitious special economic zone only in vague terms, deeming concrete promises ill-advised without more information on the project’s details. RANGOON — The acronym “SEZ” is notably absent from the campaign speeches of most candidates wooing voters in Dawei, site of a long-stalled but much-touted project that boosters say will spur development and create jobs while transforming the sleepy seaside region in southeast Burma into an industrial and maritime transit hub. Perhaps that’s because when it comes to the Dawei special economic zone (SEZ) in Tenasserim Division, it is difficult to make promises about deals to which you’re not privy; arrangements that could, all told, involve commitments from at least three governments and several companies. Kyaw Win, secretary of the USDP’s Tenasserim Division chapter, told The Irrawaddy on Tuesday that Chief Minister Myat Ko has been extolling the project’s future benefits when speaking to voters on the campaign trail, promising economic development and foreign investment that would lure additional businesses and job opportunities for locals. Myat Ko is running for re-election this November to a Dawei Township seat in the regional legislature on the USDP ticket. While both the Thai and Burmese governments, as well as more recently Japan, have pitched the SEZ as a boon for jobs and development in the region, local opposition his persisted over concerns about environmental impacts, inadequate compensation for confiscated lands and mass displacement of local populations. Some of those worries, but more importantly questions over the viability of attracting large-scale investment, have stalled for years a project first put in motion by Burma’s former military regime in 2008. And while things appeared to move forward in early August with the signing of an agreement on an initial phase of development, whether the site attracts the billions of dollars needed to create hundreds of thousands of jobs remains to be seen. The envisioned project covers about 200 square kilometers in an area 20 kilometers north of Dawei town. Its most ambitious iteration would include a deep-sea port and dockyards; an oil refinery complex and steel mill; fertilizer and petrochemical plants; medium and light industry factories; and more, according to the consultancy Roland Berger, which has worked with the Thai and Burmese governments to develop the plan. The 27-square-kilometer initial phase involves construction of a smaller port, power plants, a two-lane road to Thailand, an LNG terminal and an industrial estate for labor-intensive industries. In a September 2014 report, the Dawei Development Association (DDA) estimated that between 22,000-43,000 people would be affected by the project, which the local NGO’s research found had consistently failed to meet international best practice standards on transparency and consultation. The uncertainty surrounding Dawei and the opacity with which developments have proceeded to date are by no means unique to the project. From the suspended Myitsone hydropower dam in Kachin State to two other sites where SEZs are moving forward—in Arakan State and southeast of Rangoon—business deals have been inked under the previous military regime exercising little transparency or consultation with affected populations, and often involving foreign governments or investment. Whatever form Burma’s post-2015 government takes, its leaders will grapple with how best, or whether at all, to honor those past agreements while responding to the concerns of affected populations. In Dawei, Aung Myint is not necessarily hoping to see the new government scrap the planned SEZ entirely. “Transparency and holding accountability for the project” are what he looks for in candidates, Aung Myint told The Irrawaddy. Burma’s largest opposition party, the National League for Democracy (NLD), is promising both these things, but has also made a point to temper expectations of the changes it will make if it takes power, cognizant of the balance it will have to strike on megaprojects such as the Chinese-backed Myitsone dam. Suu Kyi got an early taste of the uncomfortable compromise that this might require in March 2013, when she visited the Letpadaung copper mine in Sagaing Division—another China-backed venture—and told villagers there to accept that the project would move forward, a suggestion met with protest from angry locals. She had chaired a parliamentary commission charged with an investigation into the mine, which found that the venture should proceed, albeit with recommended changes to its operation. During a trip to Kachin State earlier this month, Suu Kyi was reticent to make any campaign promises regarding the Myitsone dam, suspended by President Thein Sein in 2011 amid growing public opposition to the project. Contacted by The Irrawaddy, Hla Htwe, an NLD candidate for the Tenasserim regional parliament who is also campaigning in Yebyu Township, took a similar line with regard to the Dawei SEZ, admitting that he was reluctant to bring up the topic on the campaign trail without full knowledge of the agreements already in place. 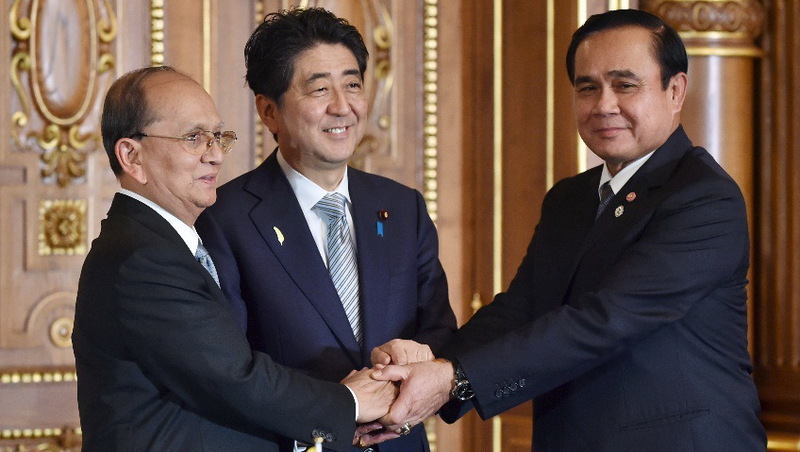 Japan’s Prime Minister Shinzo Abe, center, shakes hands with Burma’s President Thein Sein, left, and Thailand’s Prime Minister Prayut Chan-Ocha after a signing ceremony on the Dawei port project in Tokyo on July 4, 2015. Yuu Swan, a local from Pagawzone village with a population of 2,200, said about 700 acres of land in his village will need to be given up for the SEZ. The 43-year-old said he wants representatives familiar with the dynamics of the region to win seats in Parliament and raise locals’ concerns in the legislature. “These problems [relating to the SEZ] can be solved only when those who can actually represent the public are the government,” he said, adding that he hopes the jobs promised by SEZ proponents become a reality, and voicing a common complaint that the compensation scheme for those affected by the project has been deeply flawed. The DDA report last year highlighted the tangled predicament that the new government is likely to inherit. Of nearly 1,600 households surveyed, only 9 percent of those who had received compensation were given any official documentation of the money transfer, researchers found. “Compensation is the first mess to be solved once the project restarts,” said Thant Zin, a coordinator with the DDA. For a development activist such as Thant Zin, the main characteristic needed for parliamentary hopefuls campaigning in Yebyu Township, where the SEZ is located, is that their political parties have a clear vision on development and are willing to work closely with the people affected by such projects. “Only those who have been deeply involved with SEZ issues—like land-grabbing, human rights violations, relocation, infrastructure, large-scale industry—will be able to handle this when they are in the Parliament,” he said. Ko Lay Lwin, a candidate for the Tenasserim Division regional legislature with the ethnic Dawei Nationalities Party, positioned himself as well-suited to fill those requirements, when asked by The Irrawaddy about his position vis-à-vis the SEZ. The 47-year-old, who also lives in an area affected by the project, is a DDA cofounder who has been involved in the fight for local rights as the Dawei SEZ has haltingly moved forward. Though a lack of transparency and consultation have been common refrains from affected villagers, Yuu Swan claimed that this had begun to change as Burma’s landmark Nov. 8 general election approaches. “The regional government said they would accept a public-based plan. The company [Italian-Thai Development Public Company Ltd.] and government are now in talks about how much for land compensation, how much area is needed and what will be done in which areas,” he said. For some including Aung Myint, the fisherman from Mudu village, the change in tone comes too little, too late. “Since what the USDP has done for the past five years is not satisfactory, we must rely on the NLD,” he said. Top Photo - (Reuters) People on a moped drive past a sign indicating the planned special economic zone near Dawei in southeastern Burma, in November 2011.